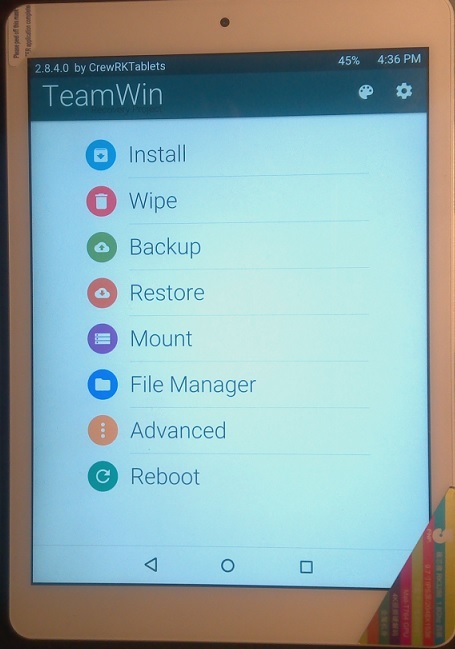 Q: Which resolutions for TWRP are available? A: Landscape 1280x800, 1920x1080, 1920x1200, 2048x1536, 2560x1600 and Portrait 800x1280, 1200x1920, 1536x2048, 1600x2560. Orientation is defined by the orientation of your kernel logo. 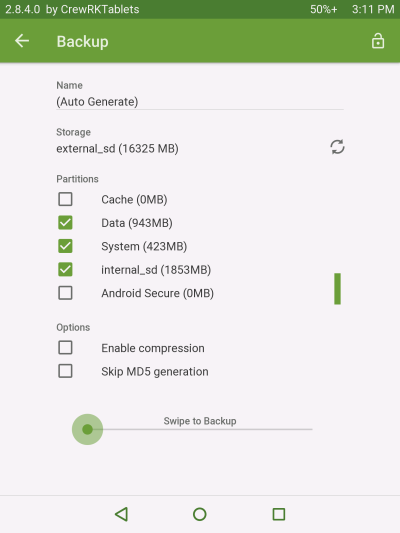 Q: Why can TWRP not mount internal sdcard? A: What is a valid reason to restore a backup? When the build is crashed or you try a new/other firmware. In both cases you have to wipe the NAND. So, internal sdcard (partition on the NAND) is lost. That's why we think working on/with internal sdcard is not very useful. On the other hand you have most likely game data (obb and user) on the internal sdcard, which will also get lost. Disabling the internal sdcard in the TWRP code will give the benefit to also backup/restore the internal sdcard. 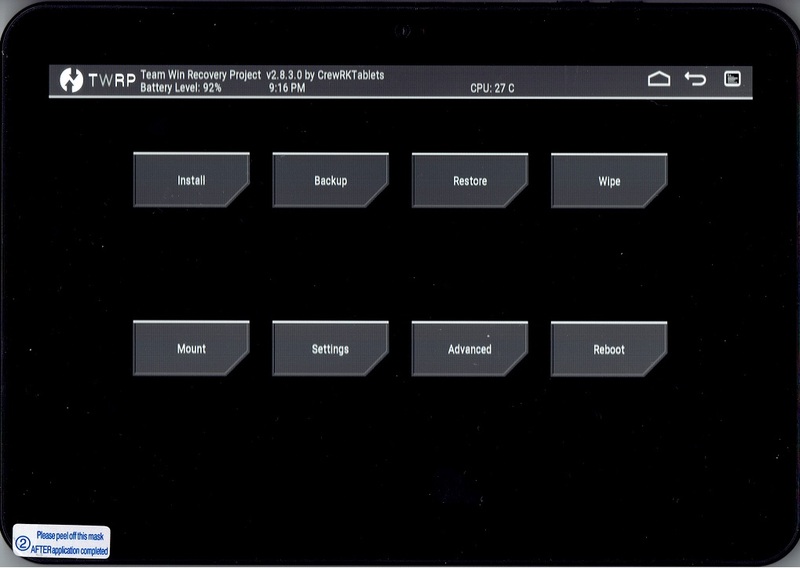 Q: Why shows TWRP an error mounting sdcard? A: Latest RK32 builds has unified internal storage, which is btw. Google standard since long. So no internal sdcard partition any longer. The error shown is irrelevant. 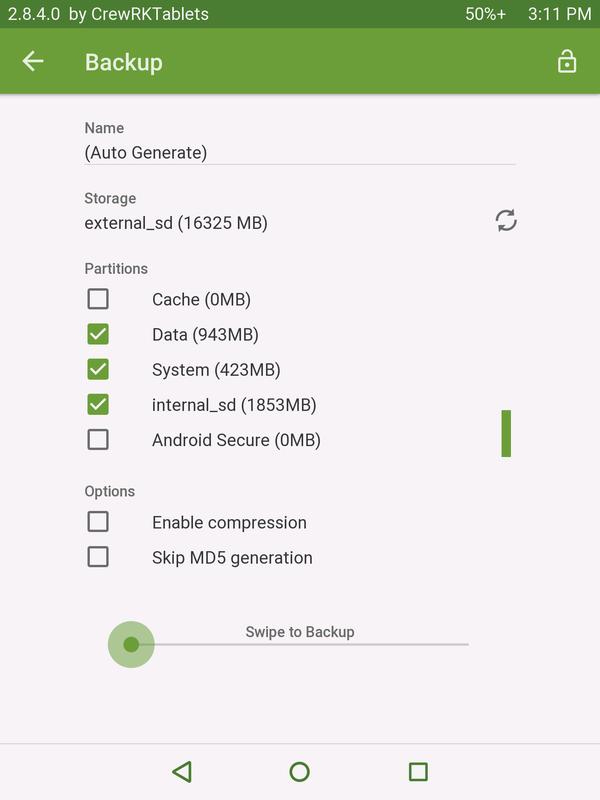 Q: Why can TWRP not mount usb storage? A: This is an unsolved bug by now. 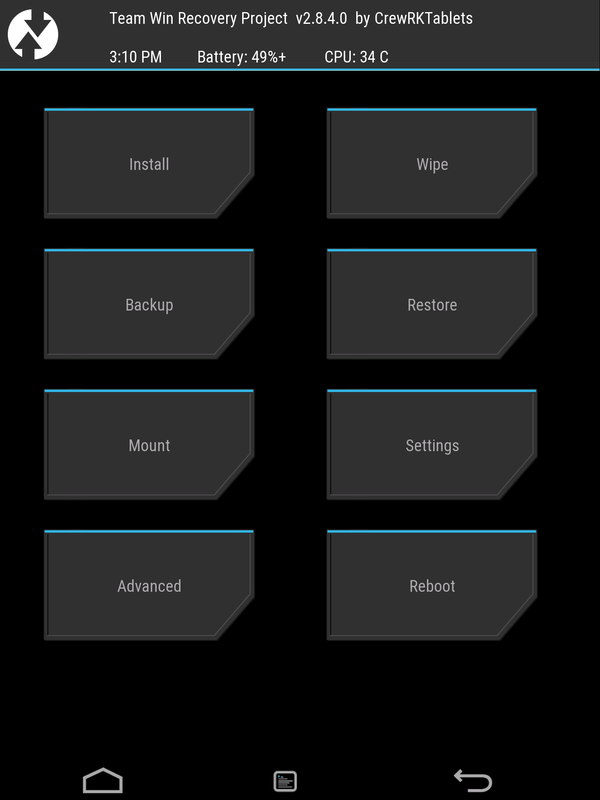 Q: Why can I not shut-off the tab from TWRP? A: Rebooting options depends on the power management chip and it's programming. In some cases proper function of the chip is not independend from the kernel because the kernel flashes every times code in the chip. The majority of the tabs comes with an "always power on strategie", which means only Power Button and USB-port to communicate with the loader. That's the reason why these tabs boot into Android when usb cable will plugged in. Also tab will not shut down when usb cable is plugged. So, that's not a kernel issue it is a kernel feature. 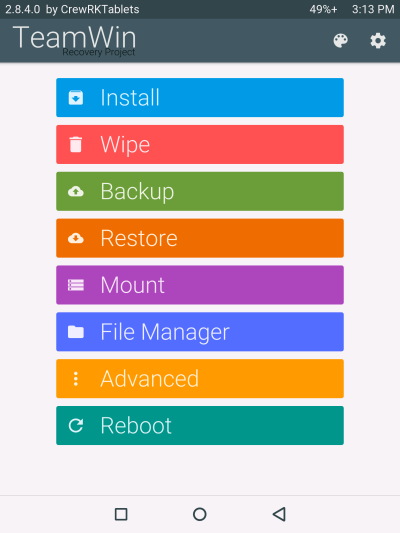 Q: Can I theme TWRP? A: Yes, there are some PLAY themes in the pack, to be installed via install zip. Happy if somebody can provide more themes, especially for landscape. Worked perfectly for an iFive Air. Thanks. Has someone managed to install CWM recovery on Beelink R89 (rk3288 tv box)? TWRP is working, but it has bug. I can not mount USB HDD and save backup on it. Also, otg port is not working. You have to stick air mouse -mini keyboard on ordinary USB port to work. When i tried to flash CWM, i got message that install suceeded, but the i can not boot into CWM recovery. I have tried via Wasser-s reboot menu, and with Pietrus Reboot apk. In both cases, box restarts himself, shows image logo and i get nothing on my tv. Box is not booting android or recovery. Then i have to plug it out and again switch it on to boot Wasser rom. Is there a way to boot into CWM recovery? See FAQ. Backup strategy is to use the external sdcard. This works generic. Mounting USB devices depends on kernel support. Also hot booting is a function of the loader, the power management chip and the kernel. In some cases only cold booting (via keypad) is possible. On boxes this might be a problem. Try to start the CWM by flashing also misc.img (tick CWM and misc). i'm using a teclast p90hd (A6K7) and follow the instructions to the end without errors or problems. But when i press vol+ and power buttons together it won't boot into cwm. it does nothing. edit: solved! 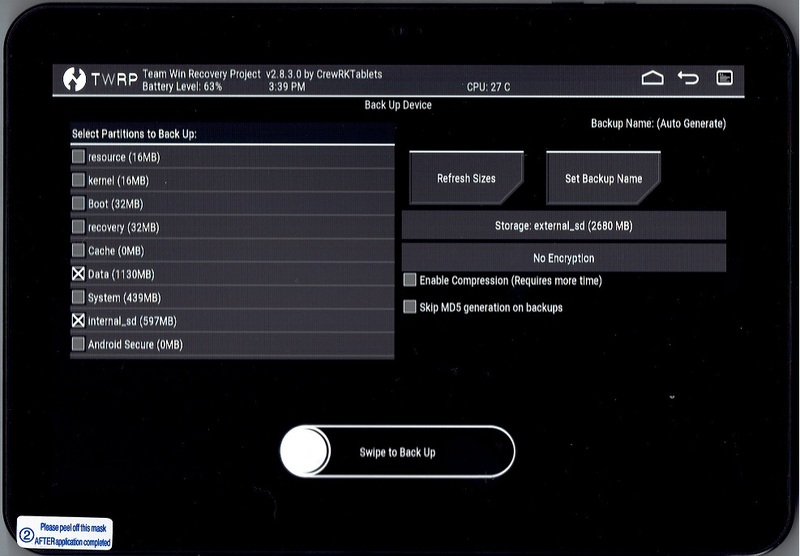 found instructions: "use the included app RebootMenue: Reboot Recovery while holding vol+"
If i want to make a backup from teclast p90hd (A6K7) stock rom (Android 4.4.2 2014-11-13) CWM recovery will abord backup while processing data backup. 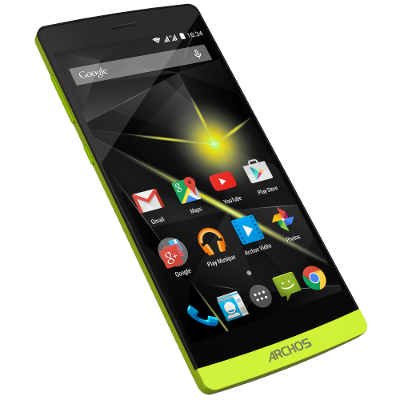 - Comes that error from the small internal storage partition? CWM isn't able to mount external sd to solve the problem. Could someone fix this, please? Just choose backup to external_sd. yep, thank you, this was my idea, too. But cwm can't mount external sd and stops backup. 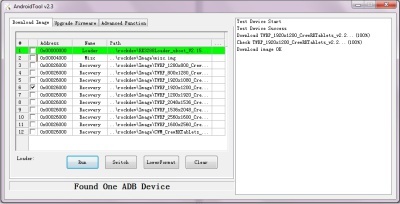 I tried many times but when i runandroid tool.exe (adm.r.) it keeps saying "loading config file failed" and the log file iw something like that "LoadConfig-->Load file failed". Then the program opens in in chinese and if i try to hit one of the tabs the program shuts down.What can i do? Any ideas? Everything is set to English language. Did you run an environment with non-Latine scripts? I had tried flashing my b368 with this recovery but with a "little" success. 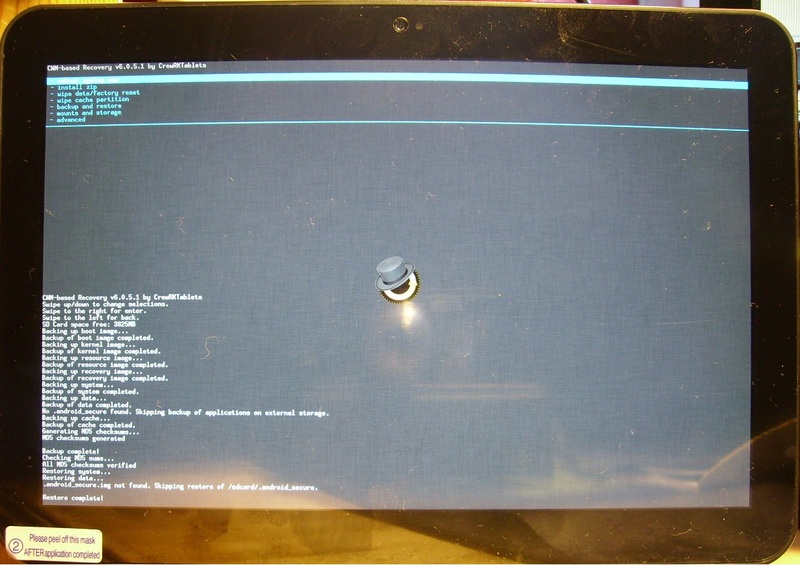 With TWRP (1920x1080), the device was able to boot to TWRP recovery. However, only the log button at the top rightmost of the screen reacted. All the other buttons didn't do anthing when selected. I'm using an AirMouse but have yet to try with a USB mouse. With CWM image, it rebooted to a black screen. So does it mean this recovery wouldn't work on my device or is there a workaround? 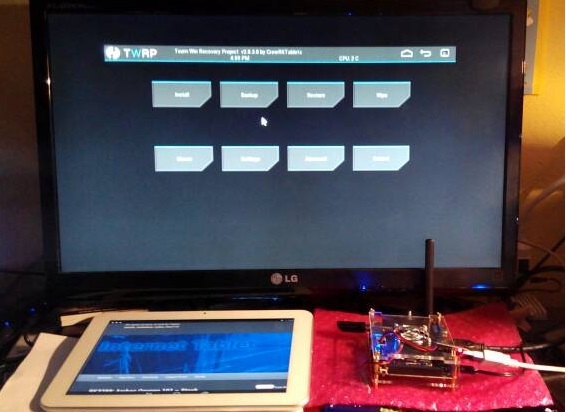 TWRP worked using a USB mouse but it seemed to take quite a while before any clicks were detected. Most partitions could be backed up but process failed when Internal-SD was selected. CWP still booted to black screen. Oma, i have a problem with the ifive air. First of all, i just dont understand what do you refer with "flash modus" (i guess its the screen which appears with an android robot and chinese stuf underneath). Do i have to enter to that mode and after it connect the tablet to the pc? Secondly, when i enter to that "flash modus", my pc cant recognize the tablet, while when i have it switched on it recognizes it without any problems. Obviously, i have installed the drivers (after uninstaling them) and i have enabled before usb debugging. My pc has windows 7 installed (just installed from ubuntu to install this). To start the tabs loader in flash modus means one can write something to the NAND chip(s). The stock recovery has not such options. But in principle the same key combination then the flash mode without cable plugged (see instructions.txt). I installed it from usb, so in reality its like a brand new windows 7, not a virtual machine. In the instructions it does not shhows the combination. I triedwith power plus vol down and an android robot appeared with an alert sign like in his tummy , with some chinese letters underneath. 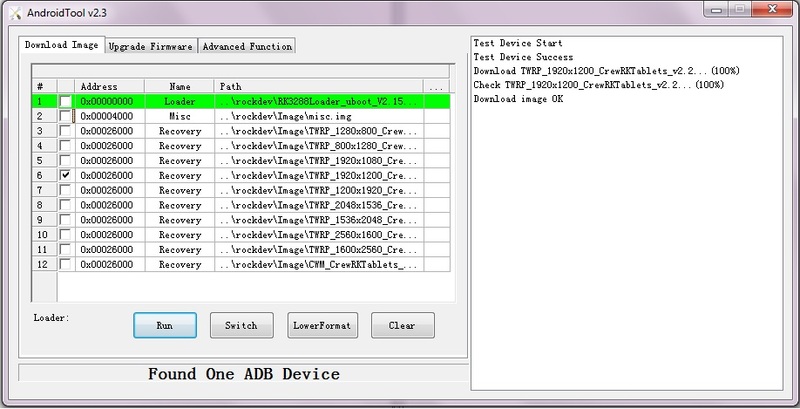 Okey, so i instal the drivers and then i plug my tab with the usb debugging enabled, and in that flash modus.